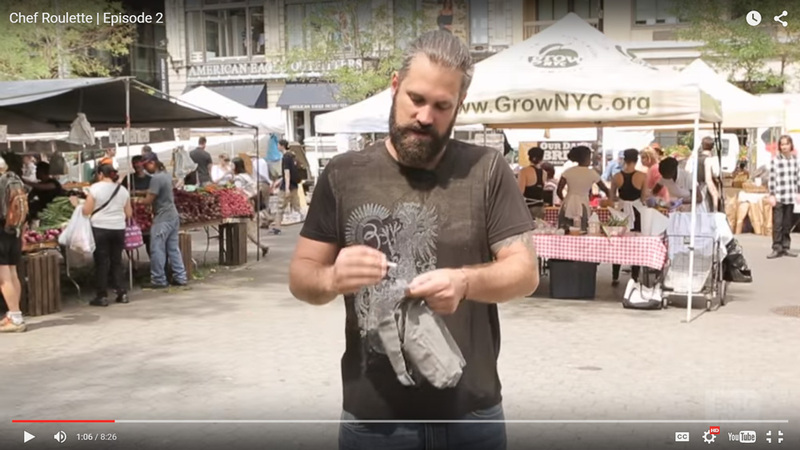 Chef Roulette is a new web series from BRIC that gives well-known Brooklyn chefs surprise ingredients and haves them prepare a master dish using them all. Episode 2 just came out and features Chef John Keller from Cherry Izakayausing ingredients like okra, squash blossoms, candy cane beets, watercress and duck. Try Delicious Sake and Japanese Pub Bites! Join chef John Keller from Brooklyn hotspot Cherry Izakaya and his friends from Dassara and Yopparai as they lead you though an hour long seated izakaya tasting paired with delicious sakes from the Southern Wine & Spirits portfolio. Izakaya typically refers to a casual Japanese eatery that serves small traditional dishes alongside sakes. 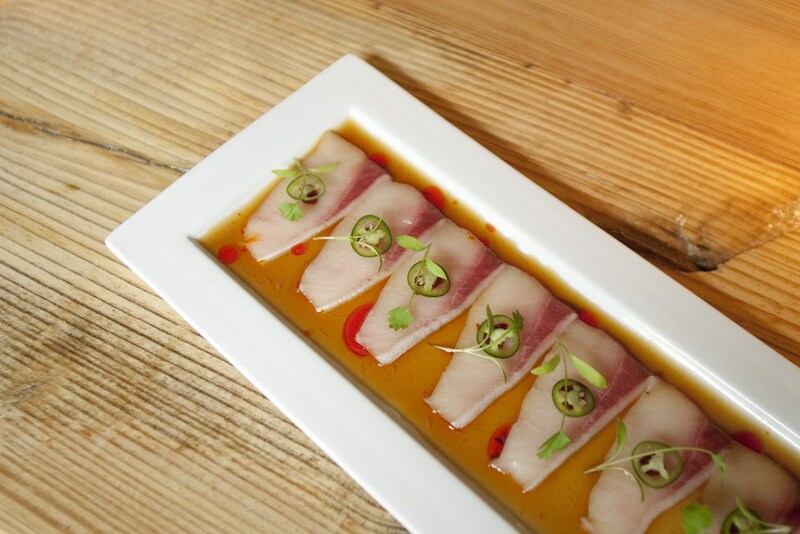 Cherry Izakaya is number 9 out of NYC's top 12 sushi restaurants. 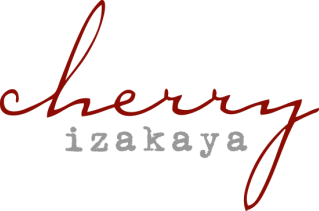 Cherry Izakaya, the Williamsburg spinoff of Chelsea's Cherry, looks like a French brasserie crossed with a traditional Japanese restaurant. So, when your order arrived at the table, and you felt yourself already being unfaithful by eyeing the perfectly-plated meal across from you, you wish you could spilt meals with your friend. But while we all can make mistakes once in a while, at Cherry Izakaya you don’t have to worry about that. It’s not often that I go to Brooklyn any more but when I do, it’s for the eats. As I got myself comfortable at Cherry Izakaya in Williamsburg, their Shiso Tipsy drink caught my eye. I ordered it immediately as I stared at all the menu options they had. The bartender, Jake, was filling me in on all the favorites and he was sharing a little history lesson on sake that added to my experiences. By the time I was ready, my Shiso Tipsy had came out which was rather strong but pretty sweet. 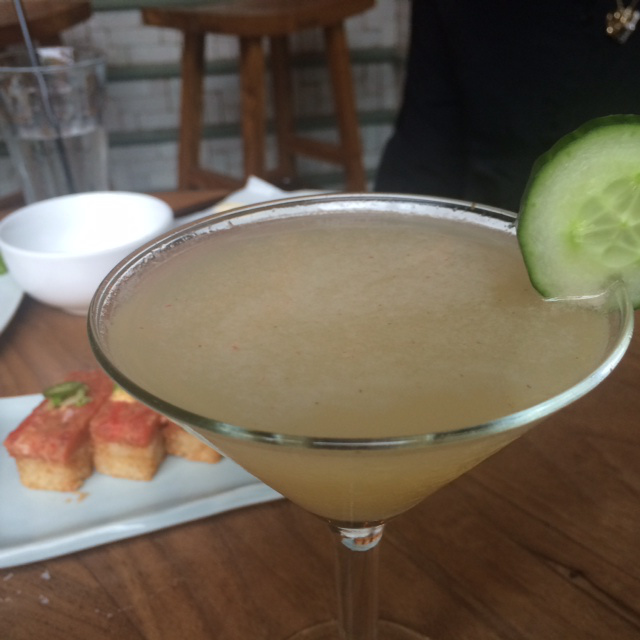 Cucumber seemed to be a huge part of this drink so I looked at it as my healthy drink of the day, ha! 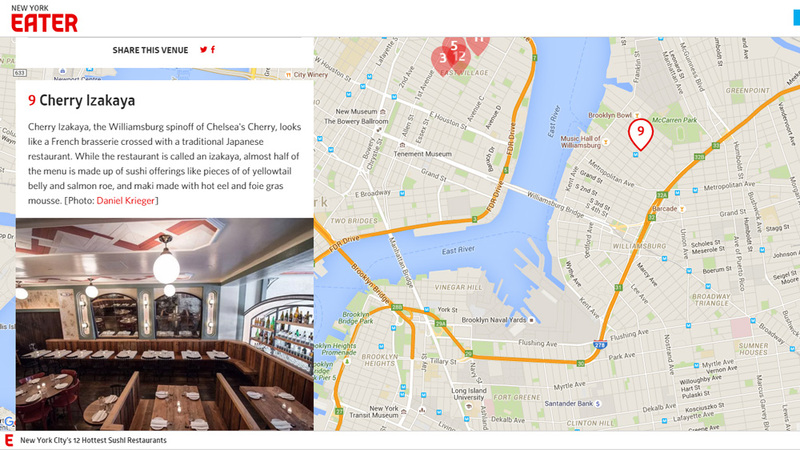 In Williamsburg on North 8th, sequestered just off of the main thoroughfare of Bedford, is Cherry Izakaya. 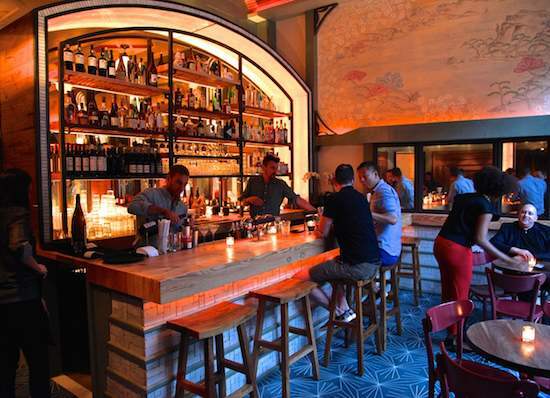 Conceptualized by Eugene Morimoto and Jonathan Morr, and realized with the assistance of Brooklyn-based design studio Home, the cheery-and-chic space is Morimoto’s Brooklyn-centric take on a traditional Japanese izakaya. 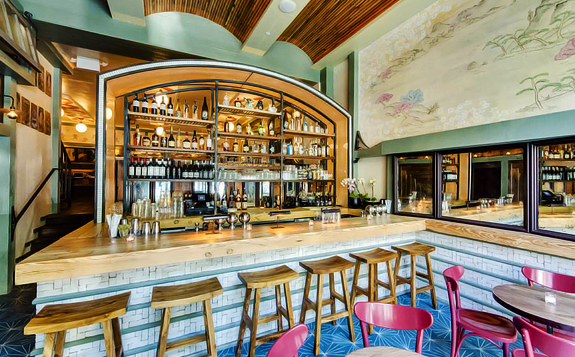 Compliments of Home - Brooklyn Based Design Firm - Cherry Izakaya is number 3 on Dwell Magazines list of the 10 best designed restaurants in America! 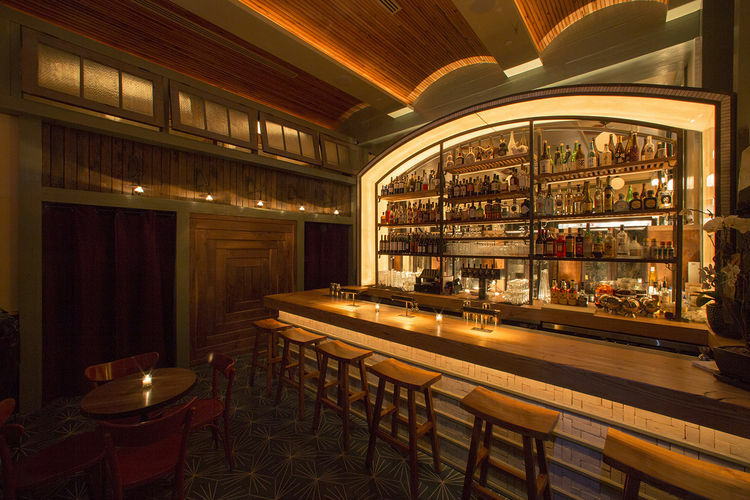 hOmE studio is responsible for some of New York's most beloved jewel-box restaurants. At Cherry Izakaya in Williamsburg, banquets made of reclaimed wood, an intricately carved ceiling, and a vintage Pachinko machine create a warm atmosphere inspired by 1970s Tokyo. The bankers are by O’lampia and the bar stools are by From the Source. 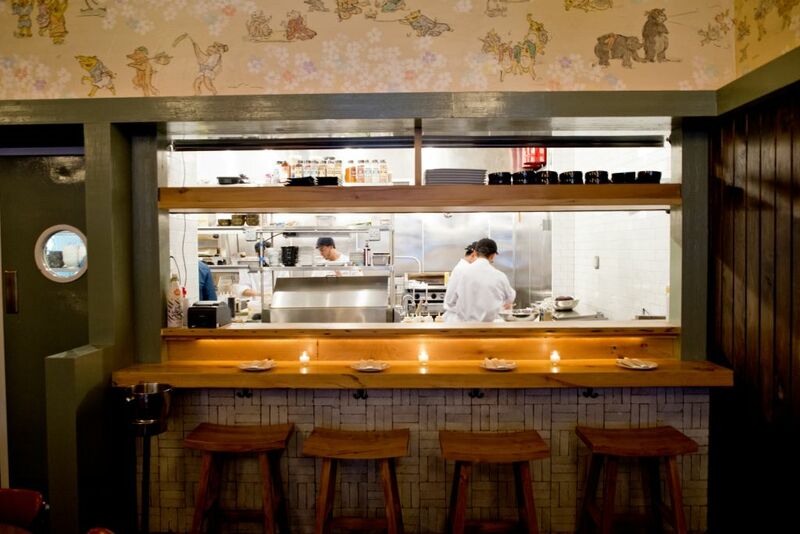 Transposing a chic downtown Japanese restaurant to a Williamsburg side street could easily hit all of the wrong notes. 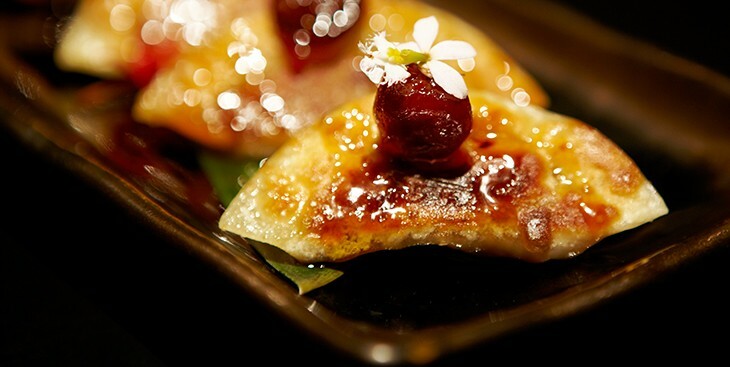 But Cherry Izakaya manages to strike the right balance with whimsical décor and exquisitely prepared small plates. 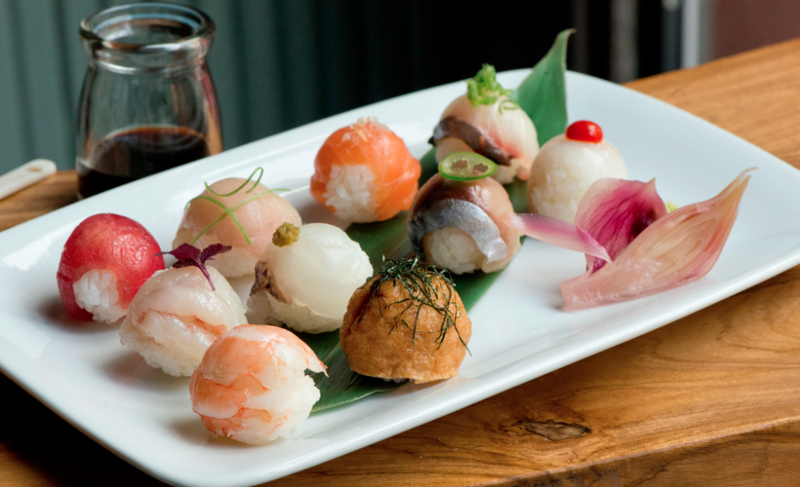 Cherry Izakaya is the new Brooklyn outpost of Jonathan Morr, whose prior ventures include Cherry in the basement of the Dream Downtown Hotel in Chelsea and NoHo’sBondst. 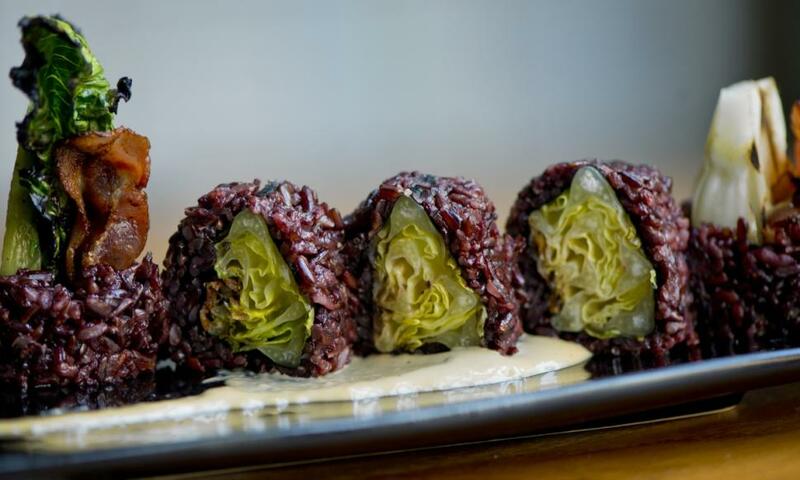 The latest jewel-box dining gem to open in Williamsburg (which has a seemingly endless supply of them) is Cherry Izakaya, a warmly-designed spin-off of the Meatpacking District hotspot Cherry at the Dream Downtown. 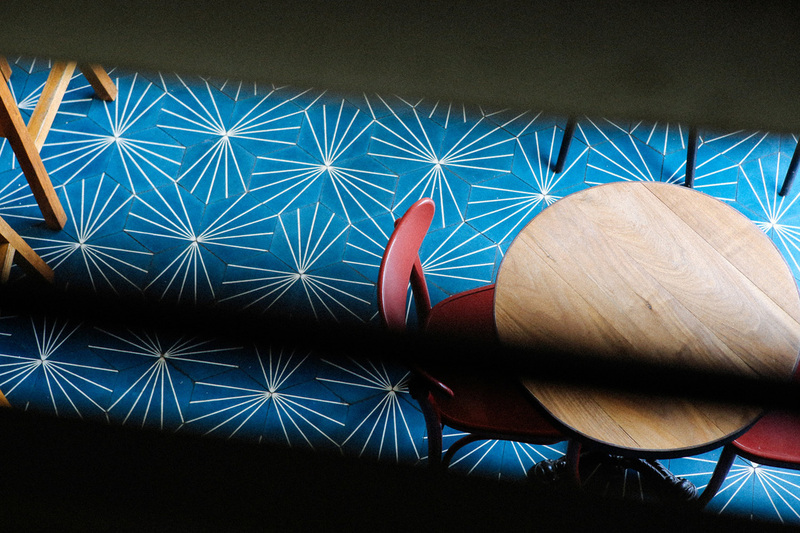 The restaurant's pretty interior is supposedly inspired by 1970s Tokyo, but it also fits right in here in 2014 Williamsburg, with ample reclaimed wood, hand-painted murals by a local artist, a glowing bar, and a vintage Pachinko machine in the foyer. 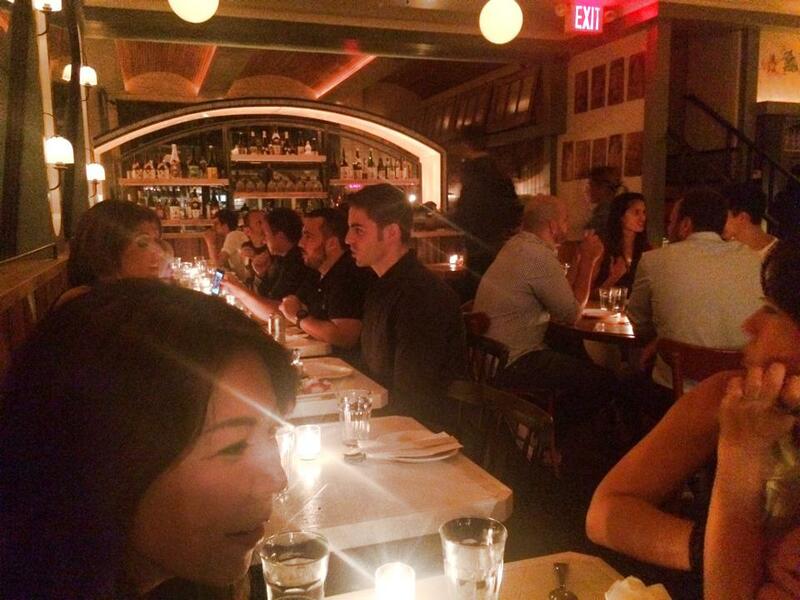 Last Friday, which was also the start of opening weekend for Lucy, her latest movie, Johansson and fiancé Romain Dauriac joined friends for the opening of the new Cherry Izakaya in Brooklyn, which is the sibling to the more upscale Cherry restaurant in Manhattan’s Dream Downtown hotel. 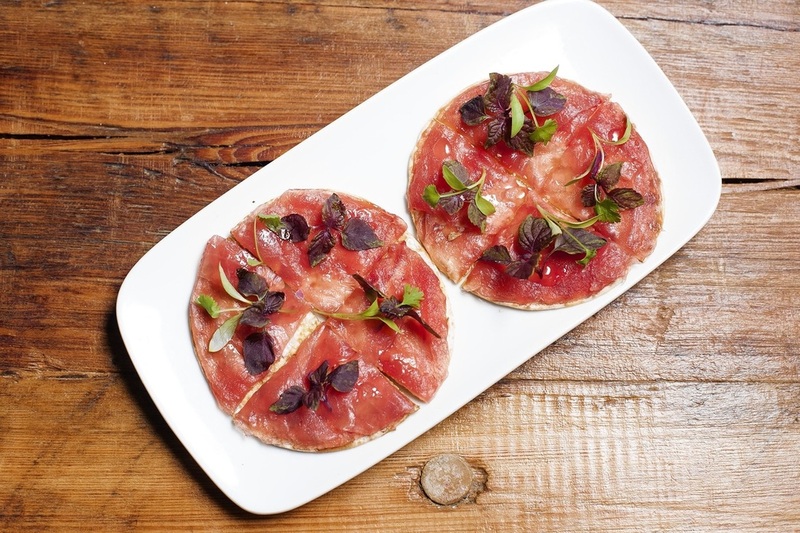 New York’s perplexing obsession with dearly priced small plates shows no signs of dying down. 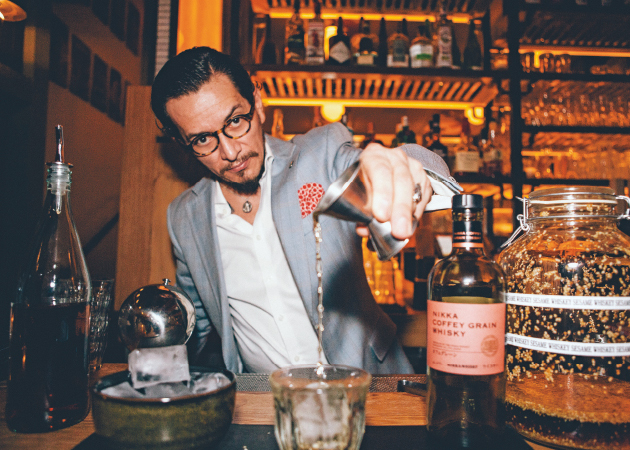 But the tide definitely appears to have turned in recent months, veering away from Spanish tapas and Mediterranean meze, in favor of sleek Japanese izakayas; casual drinking establishments serving diminutive snacks, ideally paired with light beer and sochu. But the main event at Cherry Izakaya, of course, is the food. And it is superb. The menu itself reads like a list of every delicious light morsel you might fancy of a summer’s eve. New Yorkers love a buzzy culinary trend (cronuts, anyone?). 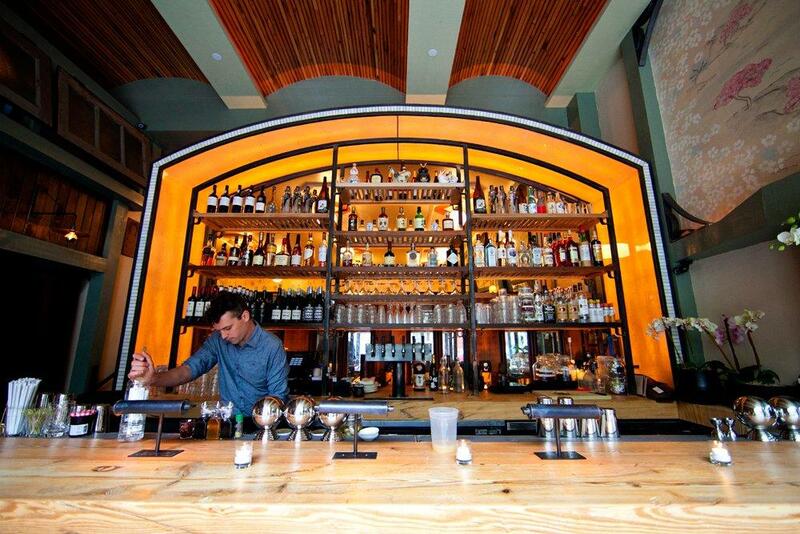 The latest craze that has the city’sfood nerds swooning? Izakayas. Traditionally thought of as modest Japanese watering holes serving tapa-sized bites, izakayas have been popping up all over the city recently. 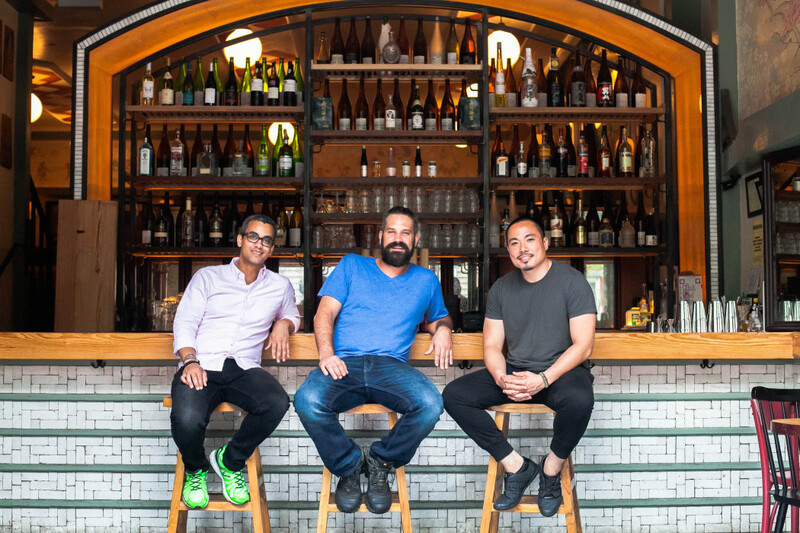 Jonathan Morr and Eugene Morimoto’s new spot, Cherry Izakaya, opening Friday in Williamsburg, Brooklyn, is the latest. 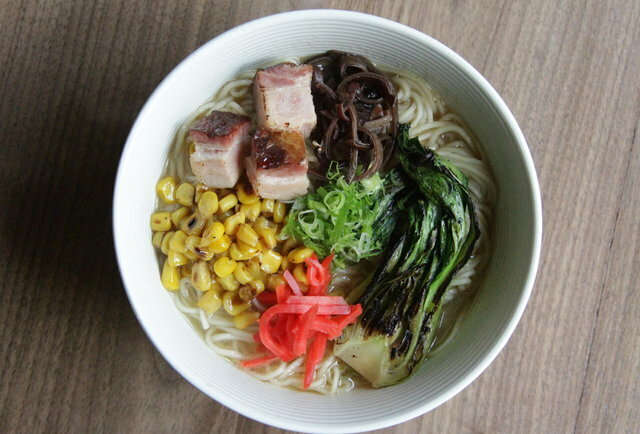 Make it happen at Cherry Izakaya, the late-night-friendly new outpost of Dream Downtown’s Japanese spot, opening later this week in Williamsburg.